What makes parenthood truly unique is that unlike those other things that people compare to roller coasters, bungee jumping or even first kisses, parenthood is less a metaphor and closer to being exactly that–crazy, thrilling, and way out of this world experience including all the projectile vomit! Some days are defined by a suspicious lack of random substances covering the walls, and other days are so hectic you’re left wondering how you’re still standing let alone how you’re managing to do anything at all with all the effort you’re putting into doing that–parenting. Regardless of whether your day is frustrating, mundane, exciting, or hectic, these days are to be treasured. Any parent will tell you that all it takes is a smile from their child to make them feel that all that bodily fluids that have ruined another item of clothing is completely worth it. With that said, if there’s something out there on the market that will make the child-rearing process easier both physically and mentally, and you’re able to acquire it, then there’s no reason to torture yourself by depriving yourself of the help. Of course, this will be entirely dependent on you and your lifestyle, keeping in mind that one parent’s essential item such as a diaper bag may seem like a frivolous purchase to some. Arguably, a good diaper bag is a staple that parents ought to have in their baby-raising arsenal. Some parents may think that having a dedicated diaper bag is excessive and that any old tote bag could work. But that doesn’t seem to be the case when you’re out for a long period carrying all of the baby’s essentials plus your essentials. Moreover, a good diaper bag can turn a stressful, tense outdoor trip into something comfortable, peaceful and fun. It allows you to bring the essentials that will ensure your baby’s comfort. There’s also a peace of mind in knowing that should anything happen, you’ve got what you need organized and ready to be pulled out at any given time! Most parents just can’t give up these advantages. And that is among the reasons why today’s market is saturated with different diaper bags, making it a challenge to choose one. Lucky you, we decided to dedicate this article to review one of the best diaper bags out there in the hopes to show you what a good diaper bag can offer and the disadvantages you also have to watch out for. The Evecase Baby Diaper Backpack comes with convenient loop straps on the side so that you can hang this bag on to a stroller, buggy bar or cart for easy and quick access to the essential items during your walks or trips to the store. Pop them on, and you don’t have to worry about lugging it around anywhere. The Evecase Baby Diaper Backpack comes with nine handy compartments and 14 pockets. The main compartment has divided sleeves and pockets that include a bottle pocket that is insulated and an easily accessible wipes pocket on the side, plus other multiple other storage pockets for whatever else you’ll need. The Evecase Baby Diaper Backpack is created to last through the inevitable beating it will receive, and is made from polyester fabric that is water-resistant, and it comes with hardware that is heavy-duty. It keeps your stored items dry and safe, and space and added durability keep your baby’s items secure and sanitary. What parents dread when they come home from an entire day out with their baby, regardless of how pleasant, is a sore back and shoulders from lugging their backpacks. Well, there’s no need to worry about that with the Evecase Diaper Backpack as it features a back-support shoulder strap that is ergonomic and padded. You can easily access your diaper wipes should you need to with the bag’s zippered wipe organizer pocket. You just have to slide in the wipes and then line up the opening. It also has a zippered pocket on top that’s perfect for items on-the-go such as toys, teething rings, pacifiers, and the like. The small zippered front pocket at the top is perfectly sized for creams, lotions, medication, and other small items. Additionally, the easy-open front pocket on the bag’s flap has a Velcro opening for quick access to larger items such as diapers or snacks, while the zippered sleeves at the sides hold larger bottles, sippy cups, or thermoses. The Evecase Baby Diaper Backpack measures 16.5 inches by 15.7 inches by 9.8 inches. It also comes with a sundry or diaper pouch that measures 9.4 inches by 5.5 inches by 2.8 inches, and a changing pad that measures 21.6 inches by 12 inches. Sits higher on your back, so your lower back isn’t taking the brunt of the weight. Despite how resilient it is, it does not last in the washer. The Evecase Baby Diaper Backpack is designed to offer parents a large storage capacity with plenty of organization options to make their trips with the baby much more enjoyable. The bag’s features such as the ergonomic padded back support shoulder straps and additional stroller straps show that the bag is versatile and meant to assist the parents as much in any possible way less the back and shoulder pains. The sleek and modern design doesn’t advertise itself as a diaper bag as well making it possible for the parents to be hip and stylish. The Maki’s Connecting Hearts Baby Diaper Bag for Girls and Boys is also among the favorite diaper bags on the market today. 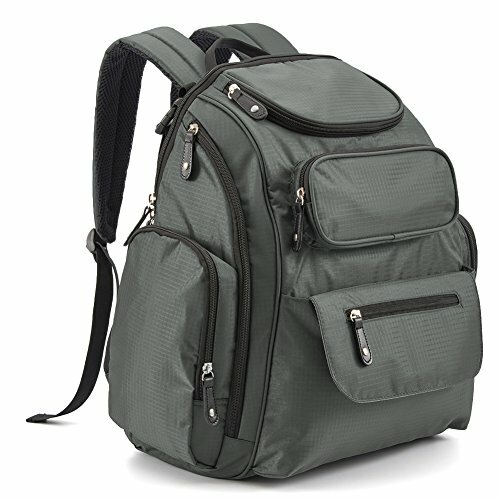 However, compared to this product’s tote bag style, we prefer the Evecase Baby Diaper Backpack as its padded shoulder straps allow for an even distribution of weight on your shoulders and back should you choose to carry it around, which is a big deal especially if you’ll be out for quite a while. Moreover, the ECOSUSI Diaper Backpack is another diaper bag which is much more similar to our product-in-review. The main difference between this bag and the Evecase Baby Diaper Backpack is their accessibility. The ECOSUSI Diaper Backpack comes with one big flap in the front that opens completely, allowing you to see everything inside while the Evecase backpack has sections for its opening. The Evecase Diaper Backpack is a great example of functionality meeting style. Not only does it have the storage, accessibility, and comfort that you want from a diaper bag, but it looks great too! Plus, the fact that you don’t have to worry much about nursing an aching back or shoulders. A diaper bag may be an accessory you can live without, but its advantages far outweigh its disadvantages. Also, your wee one won’t stay little for long, so you might as well do everything you can to make every outdoor trip memorable and fun for the both of you, including investing in a good-quality diaper bag.